To put it short – yes, it is! Vitamin E is among the substances that bring massive value to your skin. It is among the four most essential vitamins (together with A, B, and C). 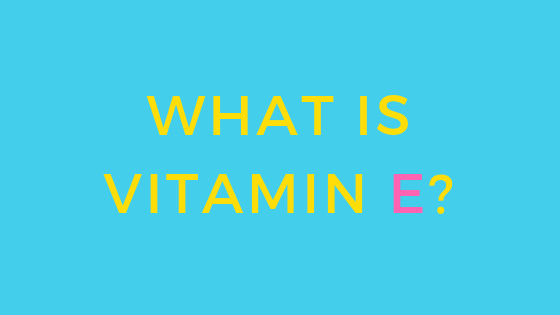 But today our word will be for vitamin E. And while the answer of the question from the title is clear, it is even more important to know why is vitamin E good for skin, and how to apply vitamin E on the skin? Till the end of the text, you will be familiar with vitamin E benefits for skin, and the ways you can use it. Let’s start! “Vitamin E is found naturally in some foods, added to others, and available as a dietary supplement. “Vitamin E” is the collective name for a group of fat-soluble compounds with distinctive antioxidant activities. There is data showing that the topical application of vitamin E leads to reducing the skin readiness, and improving the damaged sunburned cells. It also protects the skin from the UV sunlight. Can you use vitamin E for glowing skin? You bet! Combining vitamins E and C makes the sun protecting effect even stronger. One can meet vitamin E in many vegetable and essential oils, which can moisturize and nourish skin. It is an anti-oxidant, strengthening the immune system, which regulates blood sugar, stimulates fertility, optimizes blood circulation, maintains the health status of the skin, boosts its regeneration, protects skin from cancer. Vitamin E stimulates collagen production, which improves and recreates skin elasticity and slows down the aging process. You can use vitamin E on face overnight, as the benefits of vitamin E capsules are massive. Massage a capsule of vitamin E on your face, before going to bed. 2. It softens the skin on your hands. If they are dry and cracked, massage them with a vitamin E capsule. 3. It strengthens your nails. To heal them, or to keep them secure, you can blend olive oil and vitamin E, and treat your nails. 4. It nourishes cracked lips. Massage your lips with a mixture of honey and vitamin E capsule. You will get an excellent natural ointment to relieve your lips’ condition. 5. You can use vitamin E capsules for skin whitening. It protects and soothes damaged skin, helping the scars disappear. Apply the area of interest twice a day. 6. It detoxifies the body. Free radicals are molecules that have an unshared electron. These electrons connect with oxygen and result in reactive oxygen species. Free radicals can harm the cells, weakening their immune system to the level of developing cancer or cardiovascular disease. As vitamin E is a fat-soluble antioxidant, it prevents the body from producing reactive oxygen. 7. Vitamin E for hair is another big topic. You can protect not only your skin. It can prevent hair loss, and support hair growth, as the antioxidants strengthen the hair follicles and the scalp. You can blend 2 capsules vitamin E and 2 tablespoons olive oil, massaging your scalp with this vitamin E hair mask. You can also use vitamin E in case you experience split ends. Massage with a mix of coconut oil and vitamin E. It will help you get your shiny and healthy hair back. 8. It can help with skin conditions, as dermatitis. Vitamin E will reduce itching, readiness, pain, and swells. Treat the damaged skin areas for relieving effect. Yes, it could be a serious issue after losing weight, or pregnancy. 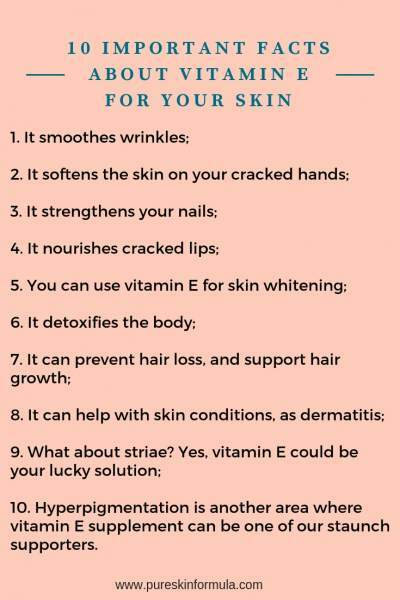 And yes, vitamin E could be your lucky solution. I have already mentioned it stimulates collagen and new skin cells’ production. Vitamin E and lemon juice is an excellent natural homemade formula in this case. Treat the damaged areas daily for two months, to feel the effect. is another area where vitamin E supplement can be one of our staunch supporters. If you have dark spots or other skin pigmentation issues, antioxidants will take care of them. A blend of equal parts castor oil and vitamin E is a recipe you can quickly prepare at home and use each evening for a month ahead. Apart from homemade recipes, you can find a lot of professional formulas of natural cosmetic products with vitamin E on the market. You remember you can see it under different chemical versions. Two popular ones you will meet on the labels are tocopherol (or tocopheryl) acetate or just tocopherol. What matters to you it’s all about vitamin E, and its benefits. Just try to research, work and continue using the right skin care and hair care cosmetics and sanitary products. Is vitamin E good for skin? I gave you at least ten reasons that you might consider when reflecting on the answer to this question. Whatever approach you choose, just do it and don’t leave your skin without care. We shouldn’t miss the opportunities nature reveals us! I would love to hear from you! Do you (plan to) use vitamin E in one way or another? Leave me a comment, and I will answer you!